Original Editors Megan Sarason from Bellarmine University's Pathophysiology of Complex Patient Problems project. A systemic connective tissue disease, found in the rheumatoid family, characterized by inflammatory and degenerative changes in the muscles and skin leading to symmetric weakness and some degree of muscle atrophy, principally in the limb girdles, neck and pharynx. This disease has also shown to effect the esophagus, lungs, and least commonly the heart. In the United States, approximately 5-10 in 1 million people are affected and the incidence appears to be increasing. 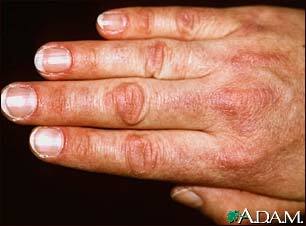 Dusky or erythematous skin rash, potentially scaly, elevated, or smooth. Typically found on the face resembling the butterfly rash associated with SLE, neck, shoulders, chest and back, forearms, lower legs, medial malleoli, and dorsum of the proximal interphalangeal and metacarpophalangeal joints. While the clinical presentation of juvenile dermatomyositis is usually different from the presentation of the adult type, the skin lesions are similar, with the exception of an increased incidence of calcinosis cutis in juvenile patients. Common findings include low-grade fever, increased risk of gastrointestinal manifestations, and symmetric arthritis of the large and small joints. Asymptomatic cardiac conduction delays or right bundle branch block may be found in 50 percent of this group. Patients may exhibit weakness of the truncal muscles that requires them to use their arms to push themselves up from a prone position (i.e., Gower's sign). There does not appear to be any association between juvenile dermatomyositis and malignancy. A number of patients with dermatomyositis also meet the criteria for one of the connective tissue disorders. To be a true overlap syndrome, the patient must meet the diagnostic criteria for each separate disorder. Overlap syndrome occurs more frequently in females than in males, with a 9:1 ratio. Eleven to 40 percent of patients with dermatomyositis have been reported to have a concomitant diagnosis of a connective tissue disorder. These disorders include rheumatoid arthritis, scleroderma, systemic lupus erythematosus, Sjögren's syndrome, polyarteritis nodosa and mixed connective tissue disease', and these patients may present withp'olyarthritis, sicca syndrome, sclerodactyly, Raynaud's phenomenon and late symptoms of myositis. Patients are also more likely to have positive nonmyositis–associated antibodies (such as double-stranded DNA, antinuclear antibodies [ANA], Scl-70, Jo-1 precipitating antibodies, PM-Scl, Ku antibodies or extractable nuclear antigen antibodies). ANA are found in up to 80 percent of patients with dermatomyositis or polymyositis, but this finding does not aid in distinguishing myositis from scleroderma or other rheumatologic diseases. Precipitating autoantibodies to the Mi-2 antigen are specific for dermatomyositis but are found in only about 20 percent of patients with dermatomyositis. In patients with overlap syndrome, the myositis tends to respond better to treatment with corticosteroids than it does in patients with an idiopathic etiology. This classification has been controversial because it does not strictly meet the criteria put forth by Bohen and Peter.Amyopathic patients essentially have pathognomonic skin changes without clinical or laboratory evidence of muscle involvement. This condition has been reported in approximately 2 to 11 percent of patients with dermatomyositis. Patients most commonly present with lethargy, pruritus, fatigue, photosensitivity or arthralgias. In some cases, myositis developed later; in others, myositis that was not found by standard methods was suspected on the basis of magnetic resonance imaging (MRI). Although an increased risk of malignancy has not been associated with juvenile dermatomyositis, it has been demonstrated in adults with dermatomyositis. This risk appears to be highest in patients diagnosed with dermatomyositis after 45 years of age. The most commonly reported malignancies are ovarian and gastric cancer, and lymphoma. Other reported malignancies include lung, male genital organ, nonmelanoma skin, Kaposi's sarcoma, mycosis fungoides and melanoma. Skin changes are not different in patients with or without malignancy. Therefore, careful investigation for malignancy should be initiated at the time dermatomyositis is diagnosed. In women with dermatomyositis, there is a significant association with ovarian cancer, and some authors recommend that the work-up for dermatomyositis include a comprehensive gynecologic evaluation, including a cancer antigen (CA-125) baseline screen, mammography and transvaginal ultrasonographic evaluation of the ovaries at baseline, and gynecologic examinations at six- to 12-month intervals for at least two years. The main goals when treating patients with dermatomyositis are improve function and prevent disability. The treatment regimen must be instituted early and requires a team approach between the physical therapist, dermatologist and family physician. While currently there is no cure for this systemic disease the symptoms can be treated. Corticosteroids are used initially to reduce the inflammation, shorten the time to normalization of muscle enzymes, and reduce morbidity. Maintenance therapy with Prednisone usually is necessary indefinitely in the adult patient. Immunosuppressive therapies may be used in individuals who do not respond well to the corticosteroids. The skin disease is primarily treated with sun avoidance, topical corticosteroids, antimalarial agents,methotrexate, mycophenolate mofetil, and/or intravenous immune globulin. Patient education is highly important to assist in control of the disease process. Impaired Joint Mobility, Motor Function, Muscle Performance, and Range of Motion Associated with Connective Tissue Dysfunction. ↑ 1.0 1.1 1.2 1.3 Goodman C, Fuller K. Pathology: Implications for the Physical Therapist. St. Louis, Missouri: Saunders Elsevier; 2009. ↑ MayoClinic.com Website. Dermatomyositis Available at: http://www.mayoclinic.com/health/dermatomyositis/DS00335 Accessed on 4/1/2010. ↑ 3.0 3.1 3.2 3.3 Hajj-ali RA. Polymyositis and Dermatomyositis. The Merck Manual of Diagnosis and Therapy. http://www.merck.com/mmpe/sec04/ch032/ch032d.html?qt=dermatomyositis&alt=sh. Updated February 2008. Accessed March 6, 2010. ↑ Sullivan DB, Cassidy JT, Petty RE. Dermatomyositis in the pediatric patient. Arthritis Rheum. 1977;20(suppl 2):327–31. ↑ Pachman LM. Juvenile dermatomyositis. Pediatr Clin North Am. 1995;42:1071–98. ↑ American Physical Therapy Association. Guide to Physical Therapy Practice. Phys Ther. 2001;81:9-744. Revised June 2003.